In place of its usual ANZAC show TVAL decided to stage an evening Air Show at Masterton’s Hood Aerodrome, March 26, 2011. As with all of the TVAL Air Shows we like to encourage the entire family to come out and enjoy the aircraft and vintage vehicles in a relaxed setting, where spectators can meet the pilots, ask questions and get up close to the aircraft. The evening start makes this event perfect for a picnic or fish and chips dinner while enjoying a unique WW1 display of aircraft and vehicles. With bad weather just about everywhere else in New Zealand, Masterton slowly improved with the sun even making an appearance by the scheduled start. 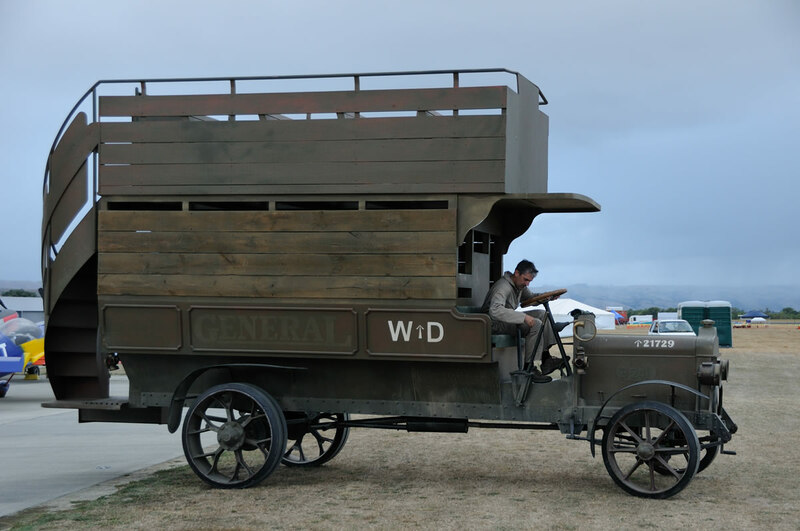 Conditions were ideal for people to enjoy the variety of pre-show activities including vintage vehicle rides around the aircraft display area in the collection’s WWI troop carriers, tanks, ambulances and staff cars. Local singer Tess O’Hara performed her renditions of WW1 era songs from the deck of a WW1 truck while waiting for the Air Show to begin. The opening act is a barnstorming favorite called the “Cottonelle Cut” named after a popular toilet roll brand, this streamer-cutting competition pitted Jan Chisum in TVAL’s Tiger Moth. Not much was left of the toilet roll afterwards. Next up was a pair of early Geoffrey deHavilland designed aircraft ; the only original flying BE 2f, flown by John Bargh, and John Lanham flying the reproduction BE 2c. 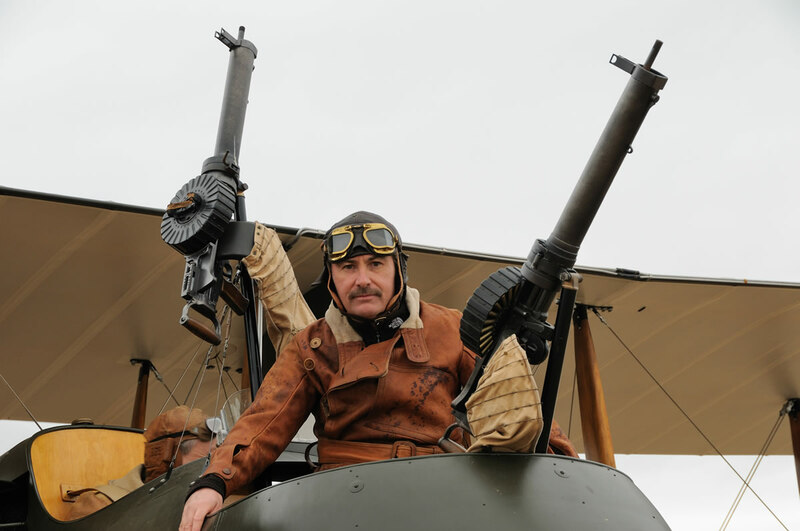 These two early aircraft are a sight to behold, fragile and slow they were used as observation platforms early in the war and then fitted with guns to become fighters. 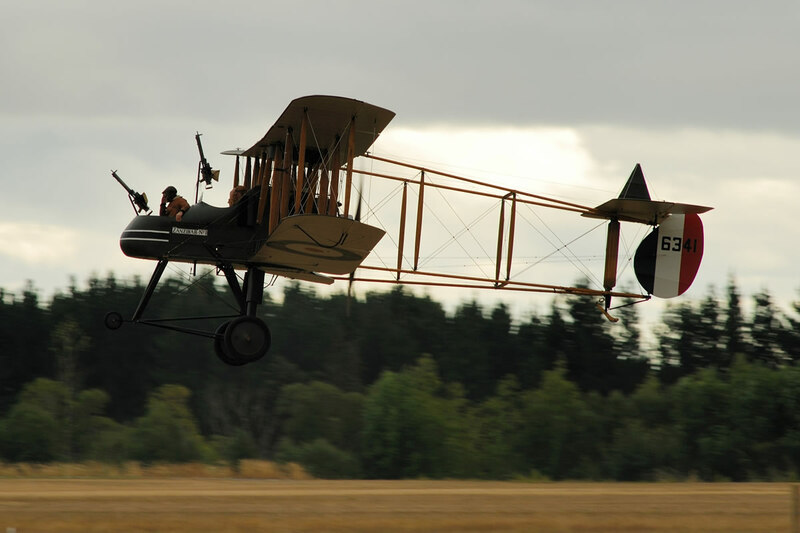 The original AVRO 504k flown by Tim Sullivan performed solo to demonstrate its 100 HP gnome rotary engine its role as a trainer during the Great War. Time for a bit of dogfighting, this time between the Pfalz and Nieuport XI. Always great crowd pleasers, these two aeroplanes are so different in noise and appearance. The Nieuport XI’s 80 HP rotary engine “blips” on and off to control speed in contrast with the deep engine note of the Pfalz to create a unique mix. 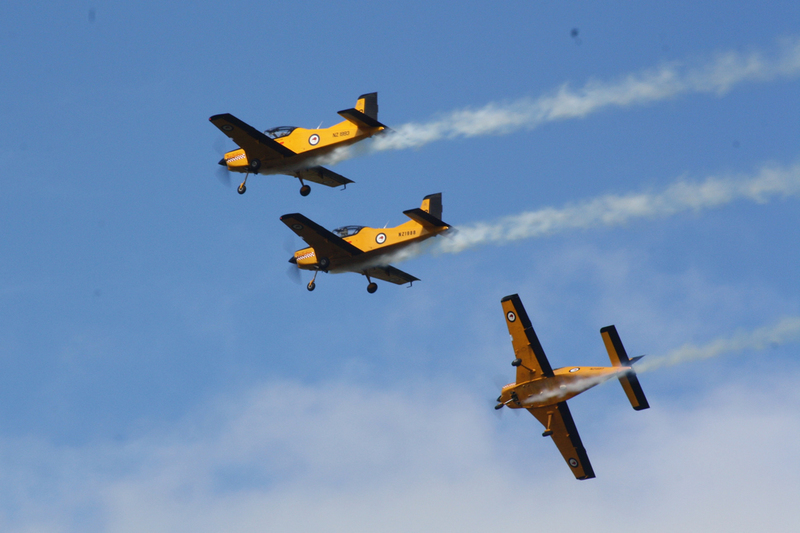 Midway through the show, the RNZAF Red Checkers were called upon to do what they do best, precision flying. Flawless formation aerobatics and exciting solo performances thrilled the crowd. 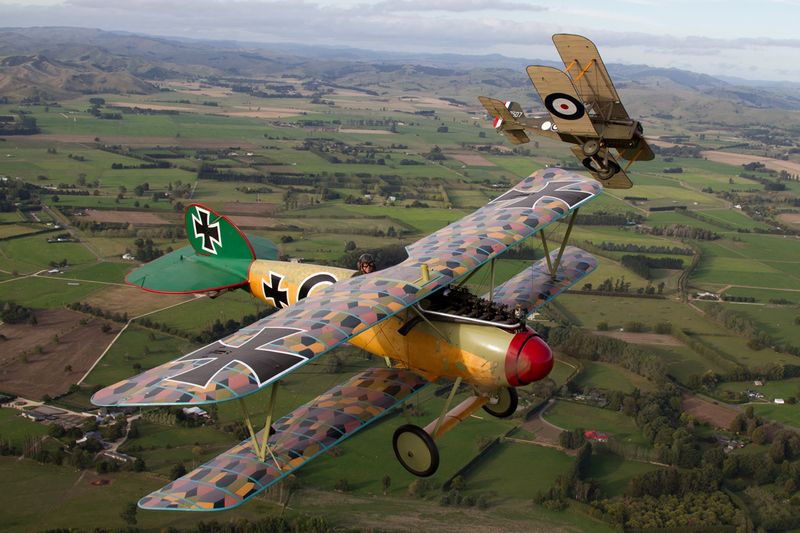 As a prelude to a real WW1 bomber becoming airborne, TVAL crew took to the air with two Tiger Moths and a Stampe, these aircraft flew formation and dropped flour bombs on the replica WWI Mk IV tank. Next up was the world’s only flying FE.2b. This aircraft is very unusual with its pusher configuration and gunner standing up front exposed to the elements, it’s always spectacular to watch! It was time to return to WWI, firstly displaying the FE 2b and followed by a series of different dogfights with the German Pfalz and Albatros (flying together for the first time in public), three Fokker Dr-1 Triplanes and the Fokker D VII against the Allied Sopwith Triplane, three Se5a scouts and Sopwith Camel. The last display of the airshow was TVAL’s original Bristol F.2b Fighter, fully airworthy at nearly 100 years old with the oldest Rolls Royce engine still flying in the world today. It is easy to become complacent living in Masterton when these aircraft can be seen every day, but a display like this is world class and it is a credit to TVAL, its skilled staff, pilots and ground crew who spend many hours behind the scenes to make it all happen. 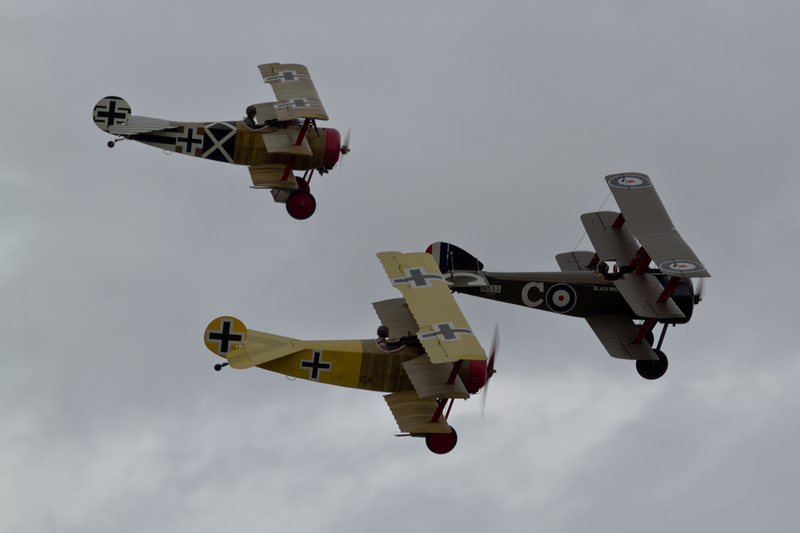 ‘Remembrance Day’ WWI Air Show. Commemorating the signing of the Armistice and the end to the Great War. 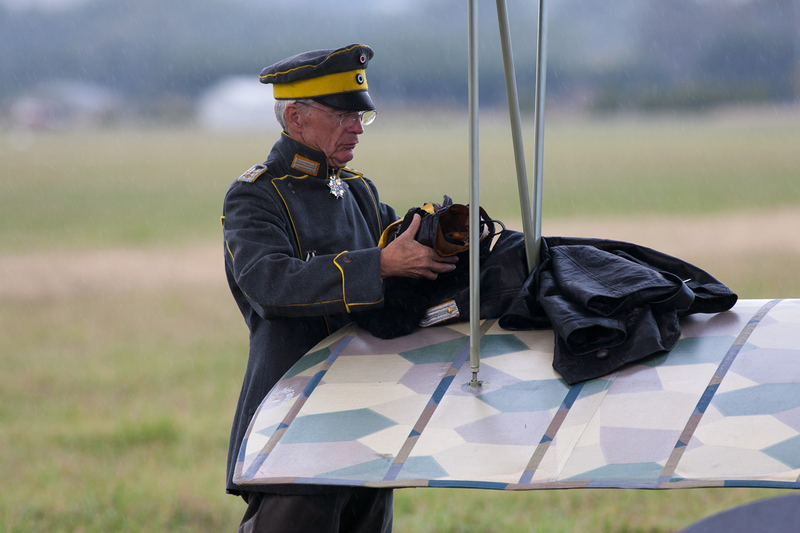 NOVEMBER 12TH 2011 at Hood Aerodrome, Masterton 1.00pm – 6.00pm. ‘Joyeux Noel’ WWI Evening Air Show. Commemorating the 1915 Christmas ceasefire along the Western Front.